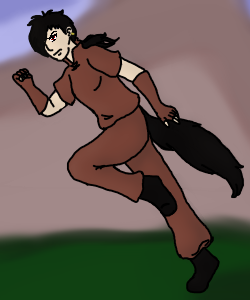 Epoh is tall with an athletic build, her eyes are red that seem to glow slightly from her pale face. Her hair is black and tied into a ponytail, she has some bangs that always fall out and cover part of her face. She wears leather clothes, and some elbow high gloves-also made of leather. Her boots go to her calf and are colored black. She has one earring in her left ear, it looks to be made of gold. 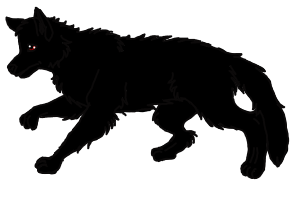 As for animal features, her teeth are sharp and come to points, and she has a black wolf tail. Her athletic muscles are still present while in this form, though they are under the shaggy fur that covers her whole body. Her red eyes seem to glow even more in this form, as they are surrounded by the black fur. Coming to five feet, she is built as a hunter and fighter, though she looks uneasy as she moves in this form. Her teeth are still sharp, and more than able of tearing into her enemies. Her black tail is always low, rarely raising past her spine when she travels in this form. Honestly she will not be in this form much. Epoh is quiet, and only talks if she thinks it is necessary. She is the type to have a goal and aim for it without letting anything stop her. May seem strict and standoffish at first, but she is a kind and gentle person by nature. It may take some time to get her to warm up to you, but it is worth the effort since she is quite loyal to those she sees as friends. Beware if you try to become her enemy, she is more than capable of striking you down, even without a weapon at her side. Strength: Beginner Has more strength than an average person, usually used for when she fights. She does have to be careful if she is fighting hand to hand, holding back her full strength so she does not overly harm someone. Normally doesn't affect her everyday actions since she doesn't put the effort into the magic when just going through normal actions. If she overuses it, she needs to rest for a time, though eating a large meal might restore her faster. Though she could likely do things like break a stone wall or lift a heavy object, she usually refrains from such actions unless she has no other choice.